VBSCRIPT EDITOR - simplexetys Webseite! 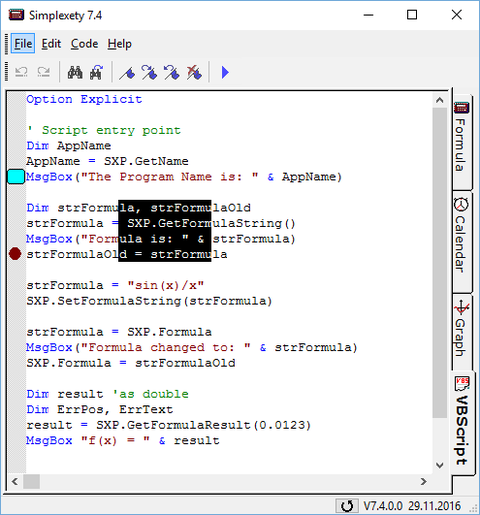 Visual Basic Script (VBScript) is a scripting language that is upwardly compatible with Visual Basic for Applications (VBA). VBA currently ships with Microsoft Office and Visual Basic. Microsoft Internet Explorer includes a COM server that implements a VBScript engine. Unlike VBA, we have add VBScript to Simplexety together with a comfortable VC++ like editor. Aside from language syntax and semantics, a key difference between VBScript and JScript is that VBScript has a complete server-side role and JScript does not. For example, VBScript can be integrated with the ISAPI component of Microsoft's Internet Information Server (IIS) to run a variety of back-end applications. You can have direct access to the Simplexety VC++ functions from this VBScript engine. Tis happens with OLE Automation methods. For a complete description of VBScript, we suggest the MSDN article about the Visual Basic Script. In addition, Microsoft has a wealth of information about VBScript at different URLs.